An elegant old banqueting suite was turned into a temporary bowling green on Friday as a series of clubs staged an unusual indoor tournament. Green mats were spread out across the floor as everyone from international medal-winners to schoolchildren and the visually-impaired took turns to play beneath the portraits of city grandees which line the Edwardian walls of Belfast City Hall. 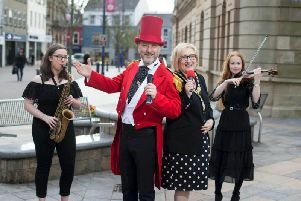 The event was part of the Lord Mayor’s bid to open the City Hall to the public more during her term in office, which has seen the hall used for disabled sports and gymnastics among other activities. “Today it was the turn of those interested in bowling,” she said. While the names of Northern Irish Commonwealth medal winners like Paddy Barnes and Michael Conlan are widely-known, those taking part yesterday were keen to point out that bowls is also a consistent sporting success story for the Province. Ian McClure, 41 and from Ballymoney, talent development officer for the Irish Bowls Federation, said: “In Northern Ireland in terms of Commonwealth sports, the big medal winners are always boxing, bowls and shooting. Neil Mulholland, 35 and a from Lisburn, picked up a silver medal in the 2014 Games. Asked whether he feels the sport is nonetheless overshadowed by the likes of boxing, he replied: “Bowls is, in many people’s eyes a minority sport. But... we do consistently come home with medals.